Fell into a really fun travel story that ran on msnbc.com this week. It's about the historic railroad bridge at Kinzua State Park in northcentral Pennsylvania. The 123-year-old bridge, once considered the eighth wonder of the world, was toppled by a tornado in 2003. On Thursday, the state opened a spectacular new see-through skywalk on what remains of the trestle. 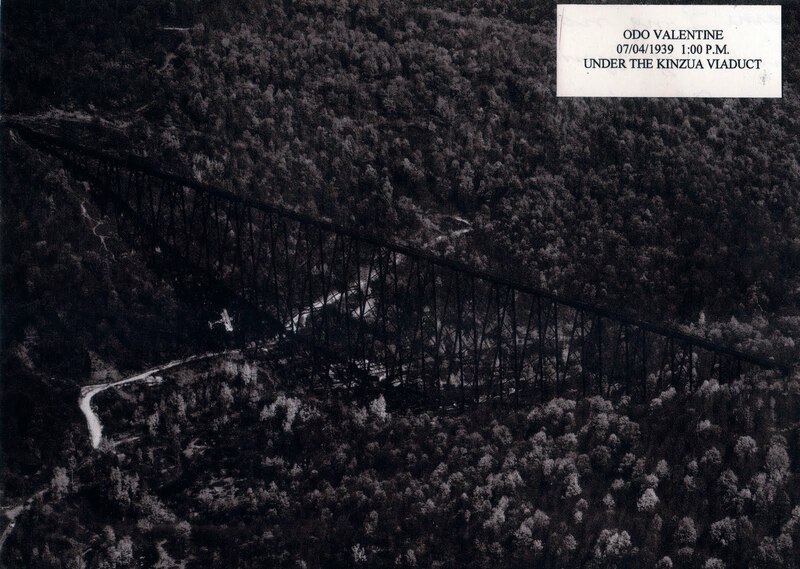 During an interview, the PR director told me the story of Odo Valentine who in 1939 flew a biplane perpendicular through the 64-foot-wide center section of span. And never told a soul. Fearful he'd lose his pilot's license, he kept the secret -- and an evidentiary picture -- to himself for nearly 70 years. It's a great story and I thought I'd share the picture (click to enlarge) and the story here. Thanks a million to Ed Bernick of North East, Pennsylvania, for sending to me. A new vertigo-inducing see-through skywalk at the Kinzua Bridge State Park will remind awestruck visitors at the northcentral Pennsylvania park why the structure was once the eighth wonder of the world. And if they time it right, they might get to meet the man who today qualifies as a world wonder unto himself. That would be 96-year-old Odo Valentine. First some history about a structure that’s properly historic. The Kinzua railroad bridge was built in 1882 to speed trains loaded with coal and timber to market via the Great Lakes. At 301-feet above the valley -- 24 feet higher than the Brooklyn Bridge -- the bridge traversed a 2,053-foot gulf of sylvan splendor. It pulsed with commercial railroad traffic six days a week, but on Sundays it was crowded with pleasure riders who came from all over to experience the tracks across the sky. It was rebuilt in 1900 by famed French railroad engineer Octave Chanute, who would become better known as the Wright Brothers tutor and was eulogized in 1910 as the father of aviation. Upon completion of the Kinzua restoration, Chanute boasted the bridge would stand 100 years. He was off by three. A tornado blew down 11 of the 20 towers on July 21, 2003. Today the Kinzua skywalk perches atop six now repaired towers and concludes with an octagon-shaped skywalk with reinforced glass views to the valley below. And maybe the only thing more incredible than the view is the story of Mr. Valentine, a barnstorming pilot determined to make his mark. On July 4, 1939, he flew a propeller-driven biplane with a 32-foot wingspan perpendicular between the 64-foot center spans at 110 mph. One gust, one slip, and Valentine would be leaving a different sort of mark on Kinzua. He deliberately chose July 4 because he knew everyone would be at a nearby holiday parade. He immediately began squelching rumors of the stunt when he learned bridge owners were livid and determined to sue if they ever caught the reckless pilot, who was sure to lose his license. For 70 years the high flyer laid low. He never told a soul. He swore the cameraman and another witness to secrecy. No one ever found out. He never lost his license and went on to be a decorated pilot trainer in World War II and the Korean War who enjoy friendly associations with famed aviators Eddie Rickenbacker and ballplayer/ace Ted Williams. She hadn’t and Thursday, Valentine will be the guest of honor at the bridge were fame’s been deferred more than seventy years. Will wonders never cease? Apparently not at Kinzua. Thanks for your story. Odo is my Dad's first cousin and, though he "never told a soul", there were stories about it in the family. I haven't seen him in years but he was a great guy. I'm so happy that picture is finally out in the world! He was a barn-stormer. How nice to hear from you, Kathleen. Thanks so much for getting in touch. I can only imagine the stories you have from a kinship with a man like that. I only spoke with him briefly, but it's obvious he's one of the last of a kind. I was so glad to have a chance to share Odo's story and that amazing picture with so many readers. At 98 years old Odo's still a firecracker his granddaughter Kimberly is my girlfriend I see Odo at least once a month. He is as rambunctious today as he was when he flew under the Kinzua. Thank you, my friend! How nice of you to get in touch. I keep meaning to pitch Odo's story to another magazine, something that would let me get up there to the area and meet him and his family. I'm sure it'd be a treat. I had the pleasure of meeting Mr. Valentine this morning at the dentist's office. While we were sitting in the waiting room, he told me the story of how he flew under the Kinzua Bridge and that he kept it a secret for many years, fearing he would lose his pilots license. Well, bravo, for you for taking the time to hear a story from an interesting elderly gent. And what a gent and what a story! That's one of my favorites. I've never met him, but still talk about him and his adventure. Thanks for taking the time to find my blog and share your story.